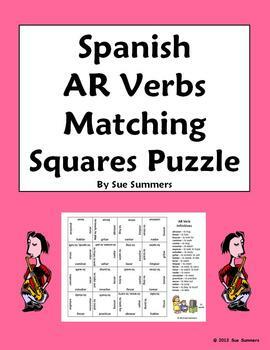 Spanish AR Verbs Matching Squares Puzzle - 21 Different Verbs - Students assemble a 4 x 4 bilingual Spanish/English vocabulary puzzle with common AR verbs. There are 21 different verbs used in the puzzle. Sample verbs are besar, cantar, caminar, mirar and buscar. Just photocopy enough for a class set (1 for every 2 students if working in pairs, or 1 per student if working alone), cut and fasten with a paper clip. Distribute to students and challenge them to reassemble the puzzles as quickly as possible. All words are listed alongside the puzzle in Spanish and English. This list is helpful when students are assembling the puzzles and also makes a good review list or bookmark. Please click here to see more of my Spanish matching squares puzzles. Please click here to see more of my Spanish verbs materials.